Lets continue on with our exciting and fascinating Dwarf Fortress Walkthrough! In this section we’ll work on getting some workshops set up and we’ll dig out a lot more space for our shorties. There’s lots to do, so lets get cracking! Workshops are a central feature of DF so lets get to grips with them right away. 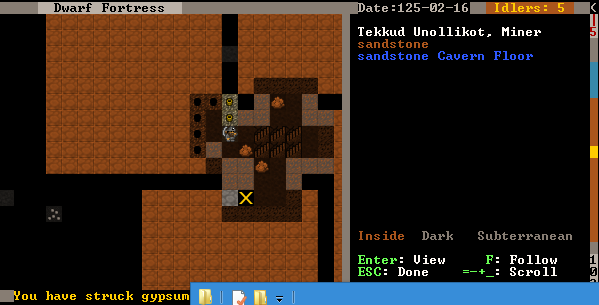 Workshops are places your dwarfs work, usually turning base materials into useful goods. The list of workshops can be a little overwhelming (b then w), but don’t worry, we only need to worry about a couple early on. Hit b for Building, and then w for Workshops. You can also just scroll down to Workshops using = and hit Enter. You will now see a list of workshops. It scrolls off the bottom of the page (scroll around if you like)! Hit c for Carpenters workshop. Chose a spot in front of the fortress. Somewhere around where mine is marked should do. Once you’re ready to place your workshop hit Enter. At this point you could just hit enter and the first item on the list will be used to build the workshop. Instead, for fun, hit x and Expand the view to show a list of every single item the workshop can be built from. Expanding the item selection is a nice way to chose exactly the item you want to be used. Most of the time you can ignore this option, but it will come in handy later on. Close the expanded menu with x again. For your interest note that items are sorted by distance from the workshop’s current location. 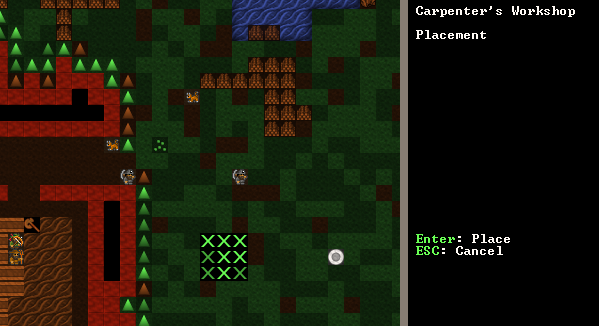 Usually you want to build with the closest items to save your dwarfs a slow walk. Your workshop is now about to be built. You will have to hit Esc a couple of times to un-pause the game, but as soon as you do I bet you that a helpful wee dwarf will run over and start building it. If you’re quick you can hit q and see the status of the workshop, it should say Construction initiated.. It doesn’t look like much, but it’s really useful! I promise! So lets get turning some of this lumber into stuff our dwarfs can use. Just don’t tell the Elves, ok? They really hate us chopping down trees. Pointy-eared gits, a magma-steam death is too good for them! Dwarfs don’t like sleeping in the dirt, they like nice, comfy beds - and solid gold statues in their bedrooms, but those will come later. 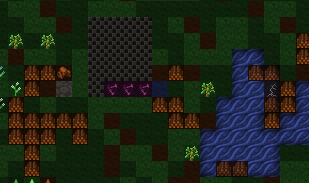 Hit q and move the cursor over the carpentry workshop. The menu on the right now shows you the actions you can take, specifically, we’re interested in a Add new task. You can scroll down to beds using =, or simply hit b. The menu now changes back to the q list and you’ll see Construct bed listed. But we want more than one bed! Hit a again, and then b. Repeat until we’ve got five beds up there. We don’t need a bed for every dwarf just yet, luckily for us they seem happy to sleep in shifts. If your workshop menu looks like this, well done! 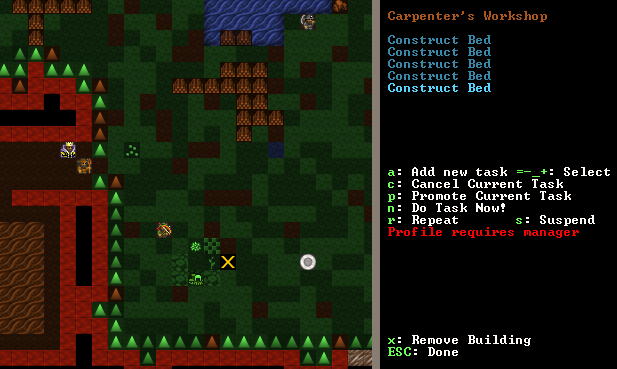 Five beds are queued up and hitting Esc a couple of times will un-pause the game and set a dwarf working, building your beds. You may have noted that there are a lot of other workshop options available to us now we have items on the build list. We can s suspend any construction, set any item to be r, repeat built, or we can hit c and cancel the construction of the current listed item. We can also have the entire workshop removed using x. For now, lets just watch the beds get built! Hit p from the main menu. hit u for Furniture Storage. 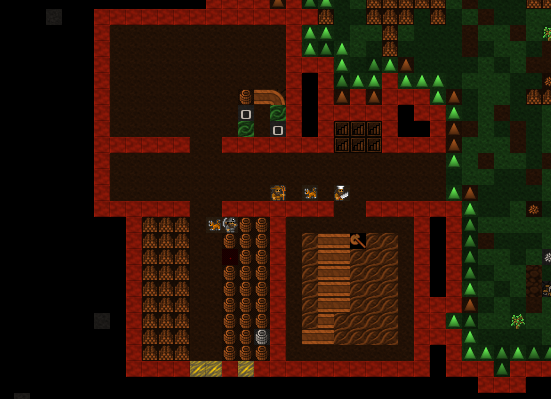 You’ll note the dwarfs have moved the constructed beds to the pile as well as some spare barrels, our anvil and a bag. As stated above, we don’t usually like to leave our stuff lying around outside, even in tidy piles, but as a temporary solution it helps keep things organised and gets the furniture moved from the workshop. 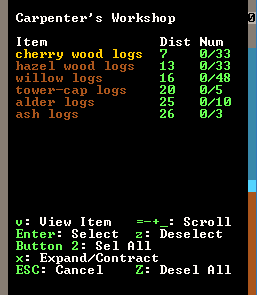 If items aren’t pulled out from under the carpenter’s feet then eventually the workshop will get cluttered (marked with [CLT] when you q over the workshop) and a cluttered workshop works slower. Later on we can remove piles by using p and then x and selecting the whole area of the stockpile. 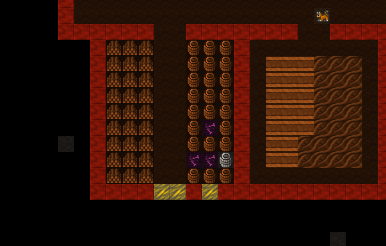 What’s better is that helpful dwarfs will grab those items and move them to another suitable pile. But enough of that, lets get on with building our fortress! What kind of Dwarfs would we be if we only scratched around on the top of this mound like dirty hobbits? We want to dig down, down, down! The easiest way of doing this is to build some stairs. Well, to be precise, we’re going to designate some stairs using the d menu. We are going to designate some un-dug space to be stairs and then see what’s going on a few metres down. So follow along, and lets get expanding! Move the map to the top side of our corridor. Hit d and then j for downward stairway. You should see six downwards stairs marked. You may be wondering why I have set six stairs down. The reason is that dwarfs need space to move past each other. If the corridor, or stairs, are only 1 wide, then they have to pause to let each other pass. 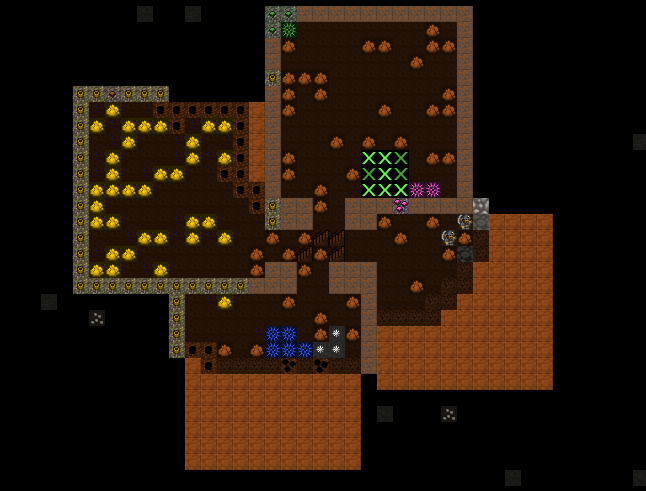 This slows movement around your fortress down terribly once you have dozens of dwarfs running around. Six stairs will be plenty for a long time. To dwarves a down stair is just an exploratory stair dug down to see what’s on the level below. It’s like knocking a hole in the floor so you can look down on your neighbours in the flat below, hoping perhaps to work out what the weird noises are. 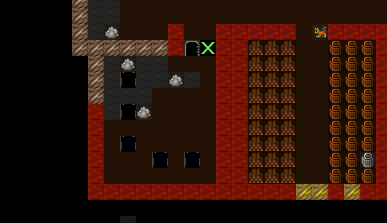 To actually go down to the level below, you need to build stairs going up from the level you’re digging to. Or in our case, we want to build an Up/Down Stairway as we are looking to dig down a long, long way. An Up/Down stairway pokes the proverbial holes in both directions. It links up with a stairway above (if there’s one there) and tries to link up with a stairway below (if there’s one there). If there’s no stairway to link up with it will provide access to those other levels so you can build the needed stairs. At this level, below our down stairs, hit d, i to designate an Up/Down Stairway. Move the X over the tan blocks. Hit Enter, move down one level, and hit Enter again. Brown X’s now show that your up-down stairway has been designated. If you mess it up, d and then x can un-designate the space for you. Lovely! Perfect up-down stairs. But we’re not done yet. So far you’ve been selecting two corners to designate a rectangle in two dimensions - but laying out a staircase would get pretty tedious like that! Luckily DF supports three-dimensional designations as well, so lay it out in 2D, then > to level 103 to finish the column. Rock! We’ve got some rock around us! This is the sort of place a good dwarf loves! How about we dig out some of this space? I suggest a set of square rooms just off the staircase, with two tile wide doorways. It’s a simple layout, but enough for now. See if you can match mine. 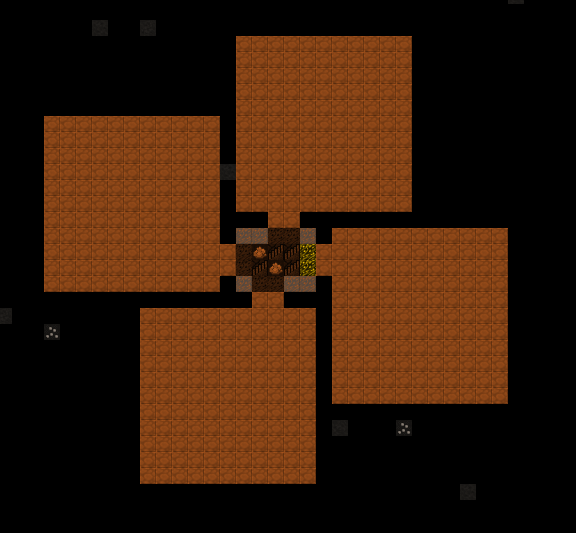 As you can see, underneath my X is a dwarf, some limestone, and a limestone cavern floor. I can use = to scroll down through those three items, and hitting Enter will display me some info about each. Ok, except for the floor. I mean, what do you want to know? It’s a floor! Look around is a very handy way to see what is in a square. Sometimes items get stacked a few deep and you’re not sure what is what, k will show you. Also, it is very handy way to find out what the walls and ground are made of. For example, without irrigation you won’t be able to build a farm plot inside on anything but soil, sand, silt, clay or loam. Look around will show you what the ground is made of. Using k I can have a closer look and see exactly what this trash is… Rat remains. Yuck! We can’t have this left lying around our tidy fortress, can we? Well, we could, but the end result would be a stinking cloud of purple miasma. Miasma makes our dwarfs unhappy. While they may never shower and probably reek to high-heaven, they really don’t like the smell of rotting leftovers. Go figure. So how do we get rid of the refuse? Easy! We build p Stockpiles for r Refuse. But note, we need to build this pile outside or we’ll get miasma build-up. Outside, the wind blows the stink away. See if you can set up a refuse pile on your own like mine. It’s just like making any other pile, except we set r for refuse as we plot it. Look, some of the refuse has already been moved! Phew, miasma criss averted! Booze is the lifeblood of dwarven society. Literally so. Dwarfs, unless injured, will prefer to drink booze over water 100% of the time. If there is no booze, they will drink water, and that’s terrible - they work slower, and are more prone to murderous tantrums. Hit l for Still, or scroll through and find the still yourself, and hit enter. Place the still in the room above the food stockpile, like this. Before we brew some booze, there’s one more thing we need: barrels. Scroll down to Make wooden Barrel, or just hit v.
Hit q and move the cursor to the still. Hit a for Add new task. Hit a and b another 7 or so times. Yay! You have now queued up a lot of beer to be made. To keep booze production at an acceptable rate, there’s a couple of options. One is to keep checking manually, but you only have to be late once to cause a tantrum! The second is to set up repeating jobs (q, select job, r), but then it’s easy for production of drinks and barrels to get out of sync and waste valuable materials. The third option is a plugin called workflow, which lets you set a target amount and will suspend and unsuspend production jobs to keep you at that level. q, select job, Alt-w, A to Add limit, R adjust the range. This might seem complicated, but setting 50-100 drinks and 10-20 barrels will keep things flowing smoothly until your population is a lot larger. End result, happy dwarfs! An important thing to note at this point is that brewing alcohol uses plants, but doesn’t destroy the seeds. Cooking does destroy the seeds of any plant cooked, which can seriously compromise your ability to grow more food! So for now, lets just stick to making some extra booze. 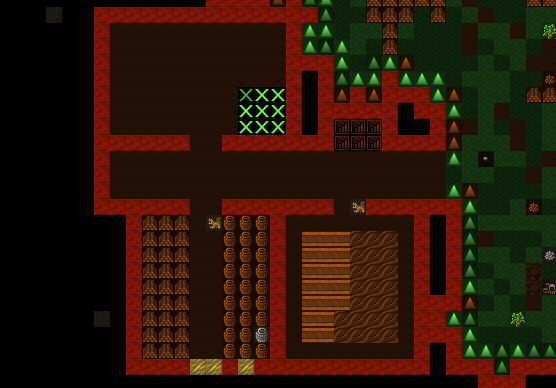 We should be ok for food for a while yet with our farm running, since dwarves love raw mushrooms. Time to head back down stairs to see how our miners are going. Let them dig at least one room out before continuing with the next step. Hopefully they’re not sleeping on the job (The big Z flashing on them)! We need doors. Lots of doors. We need beds, doors, chairs, tables. We need lots of them. If you’re starting to feel like an Ikea salesman, don’t worry, when you see a bed menacing with spikes of cat leather, engraved with an image of a dwarf striking down a goblin with other dwarfs laughing, then you’ll know you’re no longer in Sweden. So how are we going to get all of this wonderful furniture? q over the Mason’s Workshop. a for Add new task, then d for door. Do this four times. a for add task, then t for table, do this twice. a for add task, then c for chair, do this twice. Note that in DF, a chair made from stone is called a throne. They’re not the only thing to have different names depending on the material, so if in doubt check the wiki. While you’re at it, why not remove the furniture stockpile upstairs and get all of that stuff out of the rain. Go up to the pile, hit p for pile, then x and then hit Enter at one corner of the outdoors furniture stockpile, and then move the cursor to the other end and hit Enter again. Here’s my downstairs stockpile, complete with some just-moved furniture and a mason hard at work! 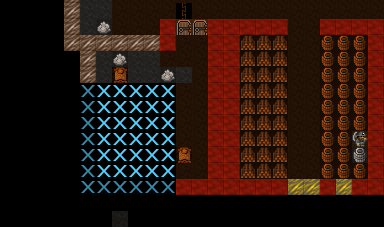 Head to the top floor, and dig out a small room at the end of the hallway. Hit b and then b again (for Bed). Spread the five beds around the room. Hit Esc until we’re back at the main menu. Hit b again, and d for Door. Place doors across the room entrance. Move the cursor near one of the beds. It will start flashing green. On the right, you’ll see the option r Make Bedroom. Hit = and this will make the blue square bigger until it fills the whole room. This menu gives you options for the room. It will always appear when you q over the item you set a room’s use from. Note, you don’t have to set every bed in the room as a bedroom (although the game will let you do that). DF is smart enough to know that the room is a bedroom, and all the beds in the room should be used. Hit d for Dormitory, this will turn the (N) to a (Y). 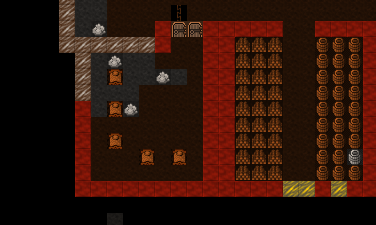 With the room set as a dormitory any dwarf without their own room will use the beds in the dormitory to sleep in. When you have a military, a Barracks is where dwarfs will spar and sleep when off duty. Well done! We have a shared bedroom for our shorties to sleep in! 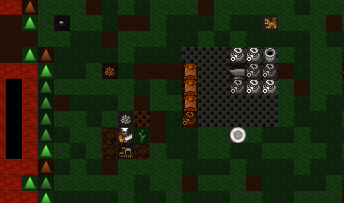 In the next chapter of the walkthrough, we’ll build a fine dining room, set up some more workshops, and start to build some proper living quarters for our dwarves. I can’t wait! 2.3. Digging down, down, down! 2.4. What’s that on the ground? 2.5. Chucking out the trash! 2.7. The World of Doors!